Early this year I discovered your website while searching for information on my bad hip. it has been a wealth of information and personal experiences for me and really helped me realize that even at 45 years of age, I better DO something about it! although my local doctors had told me I was too young for a hip replacement, I finally found a doctor 3 hours away that disagreed. I had my surgery on 14 august and although I know the full results won't be enjoyed for a while I am recovering very quickly. since I am an avid horseback rider that has been a big concern. my doctor recommended the new DePuy metal/metal 36mm hip for me - good strength and good rom. 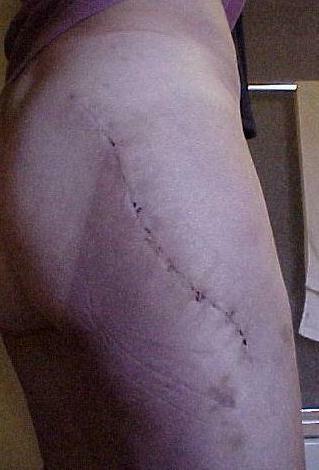 for excitement the other day, I took a picture of my scar - 2 weeks post op (amazing what us recovering hippies find exciting!). anyway, please feel free to add it to your website. thanks again for starting something so helpful!